Century Cycles Blog: Everything WAS Winterrific! 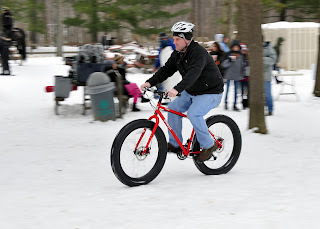 Our thanks to the Cleveland Metroparks for inviting us to participate in the 2nd annual Everything is Winterrific festival at The Chalet in Strongsville, this past Sunday, January 6, 2013. Unlike last year, we had lots of snow to enjoy winter activities, including demos of the Surly Pugsley and Surly Moonlander snow bikes! Thanks to Petch and Lynne from the Medina store, and Doug from Peninsula, who staffed the Century Cycles tables at the event, and provided information to guests about winter bicycling gear. Congratulations to Terry Coursen, the winner of our drawing for a $25 Century Cycles Gift Card! Check out more photos from the event in the slide show below, plus video coverage from Fox 8 Cleveland and NewsNet 5! Click here if the slide show or videos above are not appearing for you.